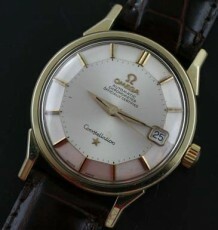 Omega Seamaster gold filled wristwatch with automatic movement. 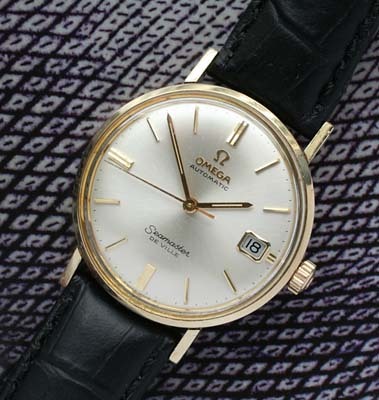 This vintage Omega Seamaster has an unusual gold-filled case. 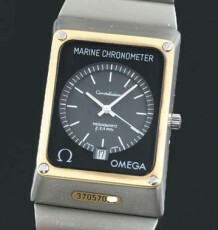 Most of Omega gold-filled cases came with just the tops of the lugs capped with gold, this model has the thick gold cladding on the entire case and back, providing the impression that it is a solid gold case. 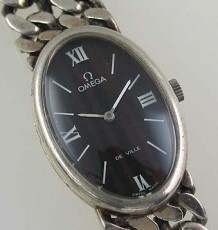 The entire watch including dial, case and movement are in outstanding condition. The all original dial has sparkling gold toned stick markers and a gold framed hour window contrasting the original satin white dial finish. 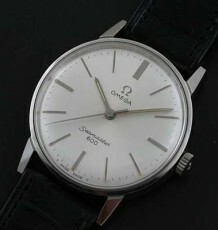 The Omega automatic calibre reference 563 was recently serviced and is keeping great time. This movement also features a quick set date feature. The watch dates to the 1967 based on the serial number in the 25 million range. The watch measures 34.5 mm wide by 40 mm long and is supplied on a black or brown leather strap.